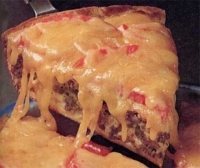 Brown meat and onion in large skillet on medium-high heat. Drain off fat. Stir in water, catsup, mustard, salt and pepper. Bring to a boil. Stir in rice; cover. Remove from heat. Let stand about 5 minutes. Fluff up with fork. Sprinkle cheese on top. Let stand until cheese melts a little. Serve with lettuce and sliced tomatoes.